Bugs, flies and ants in snooker. Funny & emotional Moments. 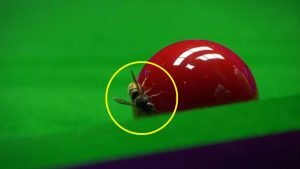 Dafabet Snooker Masters 2018 was invaded by bugs. Watch who wins in this epic bugs vs snooker showdown. 2018 Masters at London’s Alexandra Palace was full of funny, emotional and weird moments. From bugs invasion, slip of tongue, and cue ball stealing to emotional Wilson and happy Allen, it was such an amazing roller coaster ride. The Masters 2018 champion Mark Allen won £200,000 and Kyren Wilson took home a £90,000 second prize. Gotta feel sorry for Kyren, what a class act. Frame clinch by 1 point. Could possibly be an upload for you.